Experience this exciting and fun watersport at Ireland’s longest established waterski club - Golden Falls Waterski Club. This experience is for half day (9:30 am - 1:30 pm) and takes place on Saturday or Sunday (by appointment only). All equipment, life jackets and wet suits provided. All ages are catered for. Price is per person. Golden Falls’ expert and friendly instructors will help skiers of all levels enjoy this exhilarating sport. 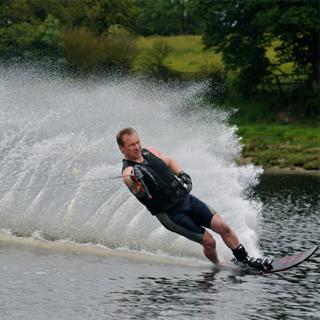 Golden Falls Waterski Club is located at Golden Falls Lake, Ballymore Eustace, near Blessington, County Kildare. 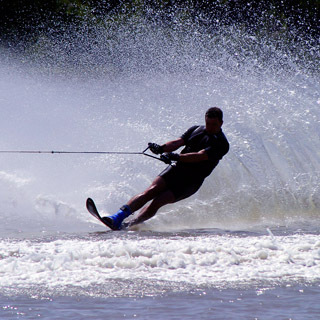 Golden Falls Waterski Club is open year round on selected weekdays and weekends. Advance booking on AllGifts.ie is required. Golden Falls Waterskiing is open weekends from April to October (after 2pm). Advance booking is essential. Golden Falls Waterski Club is located at Golden Falls Lake, Ballymore Eustace, near Blessington, Co. Kildatre. From Dublin City Centre, take the N81 south via Tallaght through Blessington. Continue on approximately 10Km further south. Watch out for the entrance on your right to Poulaphouca House Hotel. Its located just after a twisty bridge. Almost there now – continue south – and take the next turn on your right after the Poulaphouce House entrance – signposted (small) SILVERHILL. Continue 0.5km to the big stone pillar gates on your right – and follow the stud rail fencing to our private lakeside Car Park. Golden Falls Waterskiing is one of Europe’s oldest active Waterski Clubs. The magnificent fresh water Golden Falls Lake is on Dublin’s doorstep, where expert and friendly tuition will help skiers of all levels enjoy this exhilarating sport. Golden Falls Waterski Club dates back to 1959. The Club has hosted more major International Waterski Competitions than any other on our shores. Exactly 17 International Waterski Records were achieved on our waters, including the unbeaten Ladies World Jump Record of 48.6m by Emma Sheers (AUS) in August 1996 on a 5′ Jump Ramp. The Club also specialises in helping beginners to make the perfect start!